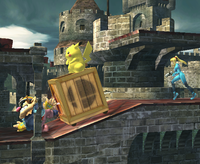 Pikachu hits Wario with a Rolling Crate in Super Smash Bros. Brawl. A Rolling Crate is an item featured in Super Smash Bros. Brawl, Super Smash Bros. for Nintendo 3DS / Wii U, and Super Smash Bros. Ultimate. Although it is technically a Crate, its effects greatly differ. Once hit, instead of being destroyed and expelling items, the Rolling Crate will begin to travel about on its wheels. It will run over any player in the way, damaging them. Players can stand on top of it as it rolls by, unlike regular Crates. If attacked with enough force, they can be broken open to release items. Wii Super Smash Bros. Brawl Special crates that look like normal ones but have four wheels attached to the undersides. Try to destroy these and they will go rolling along, smashing everyone in their path. When a rolling crate is destroyed, it will reveal the same sorts of items found in normal crates. You can also jump on a rolling crate for a fun ride. Wii U Super Smash Bros. for Wii U A normal-looking box, this one actually has wheels on the bottom. Just give the box a little nudge—its own weight will turn it into a rolling weapon. It's possible to ride on top of it, but you certainly aren't traveling in style. Be sure to stop the box or jump off before it hits something! These boxes look perfectly normal until you notice the wheels underneath. Or until you put one on a slope and watch it roll away! You an attack a rolling crate for the items inside, or send it hurtling towards your enemies. You can even jump on top and go for a ride - just make sure you get off again before you hit something! This page was last edited on January 28, 2019, at 17:04.